Soak 1/2 cup Dhuli Urad-- Husked Black Gram, for about an hour. Add the soaked daal to the meat and simmer for about 10 minutes or until the lentil is cooked through, but not soft enough to disintegrate. 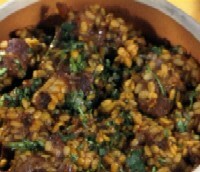 Serve garnished with coriander leaves.